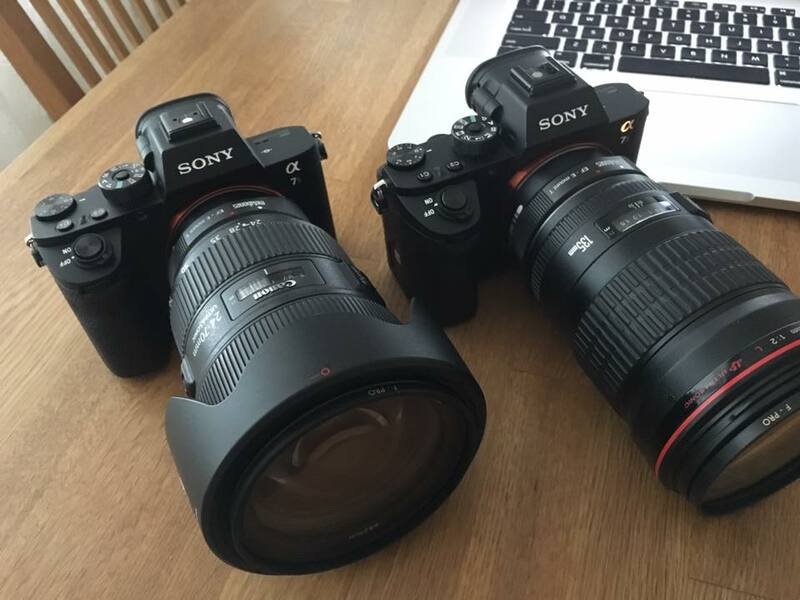 This past weekend Jill and I had our first hands-on experience with the Sony a7sii. We rented Metabones lens adapters and used our two primary Canon lenses, the 24-70mm and 135mm. Our points of reference are Canon DSLRs in run and gun situations, so this was learning to swim by jumping into water. I’ve taken a liking to these little beasts here at the end of our weekend and here are a few thoughts about our experience. Once you become accustomed to the buttons and dials, changing settings quickly comes with ease. Without looking into customizing anything we easily changed shutter speed with our right thumb and aperture with our index finger. One of the buttons on the top also let you zoom on the LCD screen to check focus, and unlike Canon we could zoom in while recording. I cannot emphasize how awesome this was for a DSLR shooter. Though I still prefer an external monitor, this was invaluable when we wanted to travel light. One really annoying thing about the Sony a7sii was the record button on the right side of the camera. I got used to it, but it just seemed a little out of place and a little awkward to reach with my thumb while trying not to drop the camera. I also didn’t really like having to push a button and then spinning the dial to change ISO, but I’m guessing that can be remedied by a custom function. The battery life was atrocious. I had read enough reviews to expect it, so we came prepared with three batteries for each camera. Three lasted with on and off shooting for a full day, but that was only because we made sure to power off the camera when we weren’t immediately going to use it. The Sony a7sii LCD screen swivels out and once I disabled the auto function that switches between that and the viewfinder (really annoying until it was shut off because it thinks you’re looking through the viewfinder when you’re not) it worked great. I liked being able to hold the camera low and swivel the screen up to see. The in-camera stabilizer (Steadyshot) on the Sony a7sii was great. I could get fairy smooth handheld shots with both non-IS lenses. The ability to record 4K internally was a dream. I had two 128GB cards per camera and I think we filled 2.5 of them. You can also fairly quickly switch to full HD at 120fps through the menu. It crops the image, which was a bummer for wide shots, but it didn’t make much of a difference. There were so many video functions that I didn’t have time to really familiarize myself with them. There were a number of color/picture profile options to choose or customize. I didn’t feel confident enough to jump fully into something like shooting in S-log, but I did find a few handy tips online to help shoot in good color. I stumbled upon this site from Amsterdam which helped me dial in some good color. Knowing there was more to dig into really got me pumped to try them again. My Canon 7d Mark II is great and I’ll probably hang onto it for a bit, but these Sonys really impressed me. The price point for the Sony a7sii is a bit high ($3,000 for the body). But considering the reasonable pricing of Sony’s cinema-style cameras ($5,500-$7,500), I’m seriously exploring the idea of moving to Sony. If I wasn’t looking beyond DSLRs, I’d be content with a 5d Mark III. Canons offer great quality and color at 1080p. Their cinema cameras are amazing, but come with a heftier price tag for 4K footage than what Sony offers.